Waiting a bit can also make people more patient, by removing their attention from the immediate here and now and stretching out their time horizons. .. The waiting also heightens the value of anticipation and makes the product seem more exciting. A world where there is nothing to wait in line for is arguably a less interesting place. 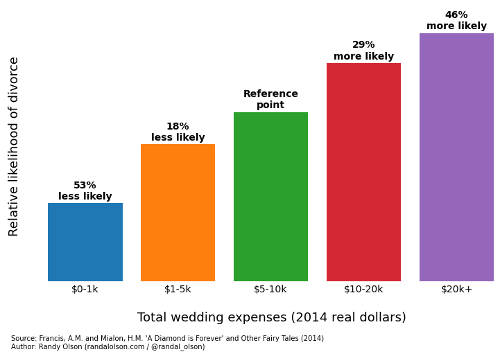 This chart has made the news lately, from a study that appears to show that the cost of one’s wedding is highly positively correlated with the probability of divorce. However the same study shows that the more people that attend a wedding, the less likely the marriage will end in divorce. So it seems that to maximize your likelihood of a long-lasting marriage, forget the expensive gowns and lavishly decorated locales. But do have 200 or more guests, only ask them to bring their own bag lunches. This WaPo article takes a peek at daily life at the “world’s busiest” Starbucks inside the CIA’s Langley, VA HQ. Dan Ariely is a well-known behavioral economics professor, author and speaker. Rethinking how we can best use the time we have in the day, he has developed Timeful that actively guides users to make the most efficient use of their day. Article here. Link to the iPhone App here. Full scale implementation may be closer than you think. As if Uber were not enough already, this NY news station warns that driverless cars may put taxi drivers out of business. 361 Capital offers a surprising list of positives below about the seismic changes driverless cars represent. You can get there faster. People have slow reflexes, which forces them to drive more slowly and further behind other cars. The stop-and-go type of traffic would come to an end. All the cars would go at the same speed! You can get there safer. Driverless cars have already driven 700,000 miles with no accidents. Some people estimate that traffic fatalities will go down 90%. And we’re talking about 30,000 people saved a year. You won’t need to widen roads. You can fit more cars on them! You won’t need auto insurance, or at least, the mandatory kind. It will change health care. A lot of emergency room traffic is from auto accidents. It goes without saying, but you can read or play games or goof off in your car. It will save a lot of gas. Cars will be way more efficient. They can drive inches away from another car, drafting, like the NASCAR drivers do. Cars that don’t wreck will last longer. New York City mommies with money to burn are hiring professional organizers to pack their kids’ trunks for summer camp — because their darlings can’t live without their 1,000-thread-count sheets. Barbara Reich of Resourceful Consultants says she and other high-paid neat freaks have been inundated with requests — and the job is no small feat. It takes three to four hours to pack for clients who demand that she fit all of the comforts of home in the luggage, including delicate touches like French-milled soaps and scented candles. At $250 an hour, the cost for a well-packed kid can run $1,000.